I decided 2017 was gonna be the year I figured out how to do my hair. Truth is I don't have great hair, it is thin and limp. The fact that I bleach the crap out of it doesn't help either, but hey I like my blonde hair:) Add that to the fact that I am lazy when it comes to hair, so my hair never really looks that great. It is so easy for me to wash and straighten it but this year I want to learn do loose waves and branch out from my standard look. After Christmas a friend told me about the Beachwaver. She had used it on her hair and it looked AMAZING! I ordered one and tried it on Friday and loved it! If you follow me on instastories you saw my trial run. The beach waver was apparently used at the Victoria's Secret fashion show- who doesn't want hair like that? I watched a few You Tube videos to get the hang of it and found it very user friendly. 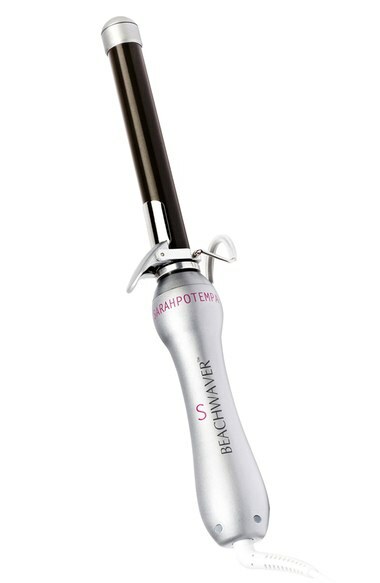 What makes the beachwaver different from regular curling irons is that it rotates. You place your hair in the clip at the bottom and then press a button and it rotates to curl your hair in the right direction. It comes with two setting fast and slow. I have been using the slow setting to get the hang of it but I think once you figure it out the fast setting would make it so quick to style your hair. Nordstrom has the newest model but I found an older model for cheaper on Amazon. I went with the 1.25 size. This was a picture I snapped after my trial run. Not too shabby for my first try. 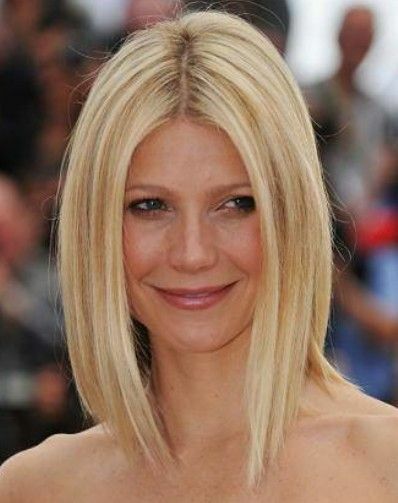 I get my hair done in a few week and I am highly considering this haircut. I always chicken out and like having longer hair but feel like this isn't too short. Then I see this picture and want long hair. Her layers are perfection. If only I could do a center part, I have this weird cowlick and can only part my hair one way. A few current everyday hair favorites. Oribe Texturizing Spray- I love this stuff and it smells amazing. It really adds volume to your hair. I use it on days I don't wash my hair and before I style it. Oribe Bright Blonde Shampoo- For any blondes this shampoo is great. It really helps preserve your color between hair appointments. Living Proof Dry Shampoo- This is my favorite dry shampoo. It helps me last several days between washing and it helps conceal my roots as well. Wet Brush- I don't know what I would do without this brush. Both kids have one too. It makes brushing wet hair so easy! Mason Pearson Brush- So I don't own this yet but every time I am home I use my mom's and love it. As I mentioned before I have really fine hair. When I use this is makes it look so much fuller. It is on my list to buy this year. Bio Ionic Round Hairbrush- I love this for drying my hair. I have the large but my mom and sister both have the medium size as well for bangs and fly-aways. Pureology Shampoo and Conditioner- I frequently switch up my shampoo and conditioner but this is always a go to. I have been using it for years and love it. Silk Pillowcase- I finally just ordered one of these after hearing rave reviews. Hair Clips- I love these non-slip hair clips for drying my hair. It's a 10 Leave in Spray- I have mentioned this many times on here but it's just that good. I use this every time I wash my hair and for Frances too. It makes detangling fine hair a breeze. Oh and in the latest issue of People my girl Gwyneth said she loves it too. Ellnet Hairspray- My mom got me hooked on this and I swear it is the best hairspray! Oribe Color Mask- I use this once a week and afterwards my hair feels like silk. I bought the trial size first to test out since it is pricey and then liked it so much I splurged for the larger size. Chi Straightening Iron- This is my go to and I use it often. I like that you can adjust the heat settings. It always gets my hair smooth and straight. Any other hair favorites I should try out?? Another thing you might be interested in is the Miracurl or Curl Secret. They are both on Amazon and foolproof! My curls last considerably longer, even in humidity. Drybar Southern Belle Volumizing Mousse. It's done wonders for my limp, fine hair (complete with a cowlick, as well). Nordstrom and Sephora sell it, or you can buy from any Drybar location. Southern Belle Volumizing Mousse by Drybar. It's been great for my fine, limp (complete with a cowlick) hair! Nordstrom and Sephora sell it or you can get it from any Drybar location. I personally think you would look amazing with the shorter cut. DO IT!!! Also, I use this product for texture and I will never go back. A little goes a long way. Tape in extensions saved my life!! 💁🏼 I've done them no matter the length, they add so much volume and are SO easy! I have them tightened every 6 weeks or so. Worth every penny. Do the long bob!!!! Will look so good. First of all... you have beautiful hair, however I have to agree that it's fun to find to ways to do our hair. I love the inspirations you picked out! Hope you have a great week! I'm so glad you posted this! I totally can't do ,y hair, either, and I'm almost 40!! Ahhh! OMG yes! Your hair would look so amazing cut like that. I really think you would be happier with it then you think, and if not it will grow back! DO IT!! I like the beach wave look too, but so hard to do. my hair doesn't hold the waves.